Have you seen the box art for the new Doom? If not, it's to your right. 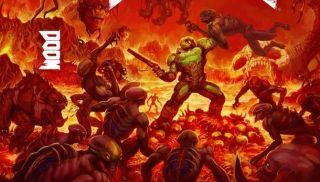 As you can see, it's a straight-on shot of the armored-up Doom guy cradling his old-school shotgun, with the word “DOOM” splayed across his chest and biceps. It's perfectly (almost satirically) conventional, “modern” videogame box art, and—if I may be so bold—stunningly dull. I mean, sure, the original Doom cover featured a guy with a gun too, but it also had grinning demons and an alarmed latecomer in the background who was upset that the party started without him. The first image is extremely reminiscent of a Venom album cover, while the second is an obvious riff on the original cover art. Personally, I prefer the first one (I was a big Venom fan back in the day) but more to the point, I like them both vastly more than what's currently slated for the front of the box. The obvious fix? Make A the reverse sleeve, and B the cover. Simple, right? Or vice-versa. That'd be okay, too. Bethesda's Doom poll is open for four days, while Doom itself will be out in 71 days, which is May 13.